As much as I like to drink, imbibe-- this post has nothing to do with everybody's favorite flavored whiskey. Even though I was born in Philly, I usually don't let on to this fact until I really have to use it. Usually right after the phrase "You Southerners..." or "Up north, we do it the right way..."
Well, I felt Southern today. For sure. Instead of planning a meal or gallivanting to the local grocer for fresh ingredients, I decided to head to tried and true K&W Cafeteria. K&W is like Picadilly, Luby's, or Bickford's. If you don't have one of these in your area, I'm sorry--you are truly missing out. 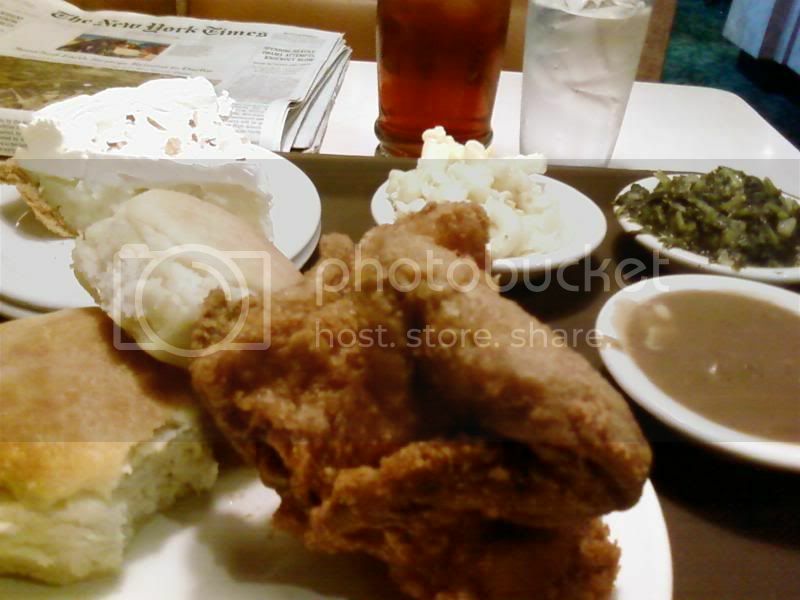 K&W specializes in Southern fare. If you have a relative or friend visit who is not familiar with Southern cuisine, if you don't feel like cooking, or you just want a variety of food at a reasonable price, go to K&W. Older Americans (baby boomers and up, is what I'm speaking of here) tend to flock to K&W in droves to eat breakfast, lunch, and dinner there. The food is sold cafeteria style or a la carte. The food is always hot, always good, and always full of calories, so be careful. Not all Southern fare is full of trans fats and calories of which to be ashamed. In Winston-Salem, there are items available that meet the standards of Heart Center Dining Program at Wake Forest Baptist Medical Center. They taste good too. I ordered NOTHING from the heart healthy menu today. NOTHING. I don't even like coconut custard pie. I ate it anyway. Did you see the glasses of tea and water holding court over the tray of food? I usually get my tea unsweetened because I cannot stand Southern sweet tea. Now that Starbucks is serving it, I feel as if I can't get away from it. I add Splenda to my tea. I'll use Equal if I have to. Today, Splenda and Equal went out to lunch too because the K&W location I went to had none. I almost cried. I thought the lady was kidding. 'Know what I did? I was like putting sand in water. It did nothing. I asked for it to be taken off my ticket. I was not about to pay for mediocrity. 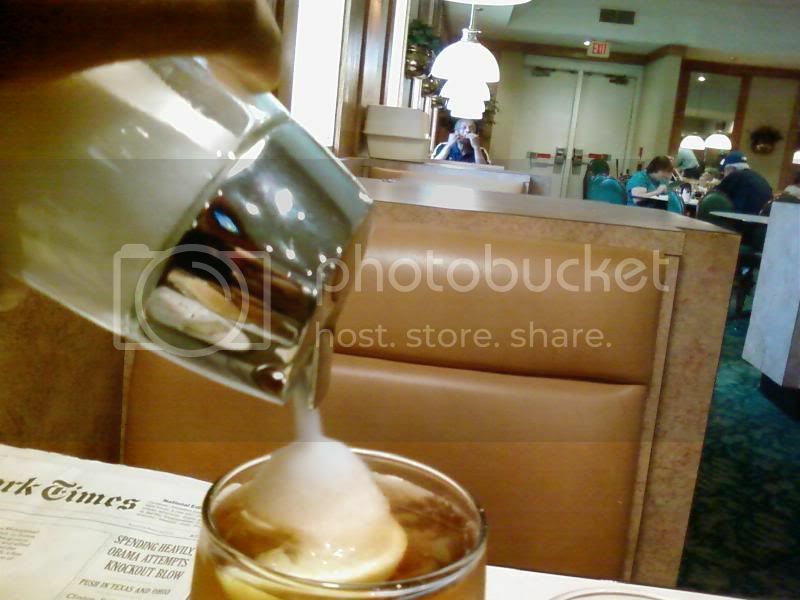 I had never heard of Sweet Tea until last year, and now it's everywhere. Even the gas stations sell it! Only in the warmer months, though, since there's not much of a call for it when the temp is 28 degrees. Back to stare at the chicken and biscuits and gravy. Thanks, Nikki! Vicci: Everyone is an "older American" compared to me, I feel. I'm just a hair past 25. My diet consists mostly of fruit, vegetables, and bread--so I don't feel so horrible when a piece of bacon dances across my plate. Sweet tea is here. Everywhere. All of the time. It's the only tea available some places. Guuuuuurrrlll! You ordered everything I would've. Except I usually hafta get some sweet potatoes in there too. Dang but I love Southern food. Heather: They didn't have any sweet potatoes that day. And I eat 'em all of the time, so even if they did, I'd prolly pass right over them.